Notes: "Haupt Austells Geb., Palais de l'industrie." 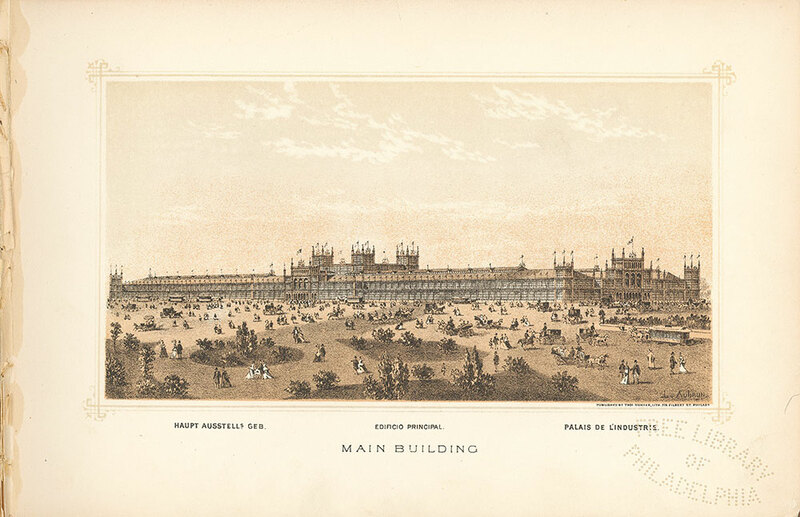 Notes: "Length 1880 ft. width 464 ft."
The largest building in the Centennial grounds was erected by the Centennial Board of Finance and occupies 21.27 acres. Two annexes for the exhibition of minerals have since been made to it on the south side, which change somewhat the appearance of the building from its original design. This magnificent structure is devoted to the exhibition of objects connected with manufactures, metallurgy, mining, education and science. The Main Building, according to the original design, is a parallelogram running east and west 1876 feet long, and from north to south 464 feet wide. It extends along the north side of Elm Avenue from Forty-first to Belmont Avenue. The height may be said to be one story, although the elevations of the roof are at different altitudes. There is a central avenue 120 feet in width, 1832 feet in length, the interior height of which at the apex of the roof is 70 feet. On either side of this is an avenue of equal length, 100 feet wide. Outside of the latter are aisles 48 feet in width; and still outside of the last named are 2 aisles 24 feet in width. The eaves of the outer avenues are 48 feet from the ground, the ceiling sloping upward. To break the great length of roof 3 transepts have been introduced, crossing the building, and being 416 feet in length. The intersections of these various avenues make at the centre of the building 9 spaces, which are from 100 to 120 feet square, and which aggregate 416 feet square. Within the main transept, rising as it were from the floor of the building, are 4 great towers, 48 feet square, which extend above the roof to the height of 120 feet. The interiors of these towers are accessible by stairways, and support a series of light galleries, which are handsomely decorated, and furnish splendid views of the interior of the building and of the upper portions of the Park and of the surrounding country. The east, west and centre of the fronts of the building are relieved of the monotony which would attach to the plain features of so great a structure by central projections with galleries and tower, and towers at the corners 75 feet from the ground. The various heights break the straight lines, and have enabled the architects to overcome the exceeding difficulty of treatment of such an immense space of building-front, which under ordinary circumstances would present a painful uniformity of appearance. The superstructure is composed of brick, iron, glass and stone, ventilation being ensured by Louvre windows, and the lighting being perfect, so that everything can be seen during the ordinary hours of daylight with better advantage than was ever before afforded in a building of this kind. There are 672 iron columns to support the interior; they are placed upon piers of masonry, are 24 feet apart, and sustain the iron roof-trusses. Some of these pillars are but 23 feet in length; the largest, 125 feet. The aggregate weight of columns is 2,200,000 pounds; the roof-truss and girders, 5,000,000 pounds. The building contains five miles of avenues and thirty-five miles of tansepts and aisles. More than half the present population of Philadelphia could be placed within its walls at one time. The pillars and roof are tastefully decorated; the walls are ornamented; so that even when it was empty the structure was attractive. The turrets, the emblems and trophies over the entrances, the gay flags floating from hundreds of staffs, render the building exceedingly effective. The annexes to the Main Building give considerable additional space. The architects were Henry Pettit and Joseph M. Wilson; the builder, Richard J. Dobbins. Cost, $1,600,000. The building was commenced May 8, 1875; last girder set up November 18 of same year; completed and transferred to the Centennial Commission February 14, 1876. Notes: 1 lithograph; 12 x 22 cm. Notes: Architect: Henry Pettit and Joseph M. Wilson. Notes: Removed from: Centennial portfolio / Thompson Westcott. Philadelphia : T. Hunter, 1876. Notes: The Building, situated in a landscaped field, with people strolling in the foreground. Creator Name: Westcott, Thompson. Centennial portfolio.